Being a digital nomad in Barcelona this past month has been a unique experience. It felt more like a vacation than anything else as I only worked an hour or two in the mornings over breakfast and spent the rest of the month going on walking tours of the city, having tapas and wine, or otherwise just exploring all that the city had to offer. I even spent a week living in a 12th Century Monastery built in 1285! Best of all, even in the middle of no where, 2 hours north of Barcelona, we had wifi which allowed us to continue building online businesses and make enough passive income to keep traveling and enjoying what the world has to offer. It's crazy that I'm I'm currently writing this in southern Ireland in the middle of a 8 day hike down the Wicklow Way. Keep an eye out for the full blog post coming soon, but it's been an epic journey so far and none of this would have been possible if it wasn't for the passive income streams I setup while working as a digital nomad these past years. In this month's nomadic update, I'm going to share where I've been, what I learned, and my plans, goals and to do list for the next month. 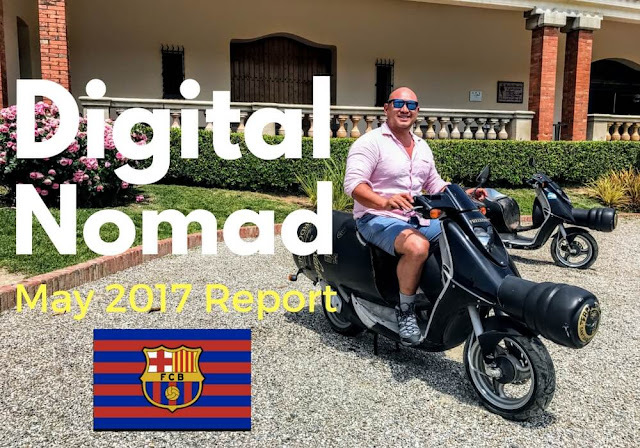 I started the month of May in Barcelona, Spain and which I've written about extensively in my Digital Nomad's Guide to Barcelona so if you haven't read that yet, check it out. During that month along stay in Barcelona I took a lot of side trips, including hiking around Barcelona to prepare myself for the long hike I'm doing now across Ireland. But while I was there I also spent a week in a 12th century monastery on a Coworkation retreat. It was my buddy Sam Mark's and Leanne's idea to go, so I figured I'd tag along and meet with people in the coworking scene to see what's up. In Barcelona I was invited to speak at one of their digital nomad meetups called Nomad Talks. Every time I go to a new city I love meeting up the local entrepreneurs and the digital nomads there. I also made an announcement on my email list inviting everyone who follow's the blog to come meetup afterwards for tapas and beer. So if you're not on the email list yet, make sure you sign up so I can let you know about the next meetup in your city. Even though I'll be back to Spain, at least for a little bit as I've left all of my luggage there, I've flown to Ireland to meet up with my buddy Sam Marks to do a charity walk here. As I'm writing this, i'm staying at an old farm house in the middle of the Wicklow Mountains, a 5 day walk south from Dublin. It's been a pretty crazy adventure so far, but it's been both fun, and a great way to raise awareness for a charity campaign Sam put on GoFundMe. It's only been up for a few days, but we're already almost at our first initial goal! Take a look at the page and watch the video on it if you want more information on how you can spread the word or donate and help support building playgrounds for kids in 3rd world countries. I'm currently writing up each day's post in a draft so I can release a mega post about the Wicklow Way when we're through with the hike, but so far it's been five days of long, torturous walks. Keep an eye out the blog and make sure you subscribe to the email list to get informed of when it's out. But as far as the long hikes are concerned, the good news is I've had a lot of time to think about what I want to do with my life now that I've technically retired from the income I've made online these past couple of years and don't actually need to work anymore. What I've realized after a lot of long pondering is that it's no longer just about me. If it was, I would probably be content living in Chiang Mai for $1,200 a month for the rest of my life and I could stop working today. But if I want to be able to continue giving my mother $1,000 a month and donating money to charities that I believe in, I need to continue to build businesses and be successful. I also started thinking a lot about wanting to have kids someday in the next 5 years and that if I want to be able to provide them a good life I need to think of them today. I don't know exactly what I'm going to do next, but whatever it is, I can't simply live off of just what I've built in the past. I need to get back into income growth mode. The good news is that even though I haven't been working for the past 3 months, I'm still making over $6,000 a month in passive income, which if I wasn't giving so much of it away or flying all over the place, would actually be more than enough to live off of. I'm still making money from my books, (12 weeks in Thailand, and Life Changes Quick) udemy, courses, blogs, podcasts, and other sources. 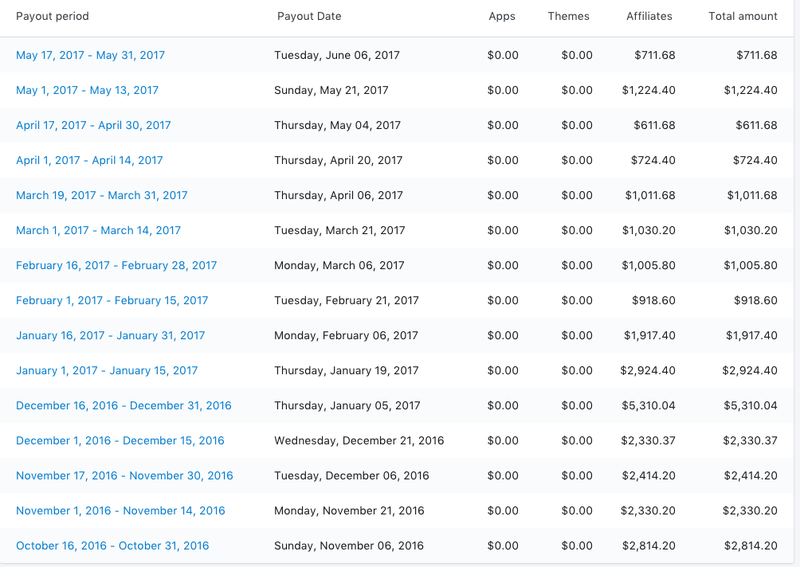 I'm even making over $100 a month now from My Youtube Channel, as I'm uploading a lot more videos now, including some courses that people have liked and shared around the net. I'm also making a decent amount of money from a couple of the dropshipping stores I started with partners a few months back, but we're mainly waiting for the 12 month mark so we can sell them for a big profit like I did my other stores. But aside from those sources, my biggest source of income by far is from the affiliate income I make each month. If you want to learn step by step how I set it all up and see the in depth case studies, just follow what I teach inside my course Earnest Affiliate. 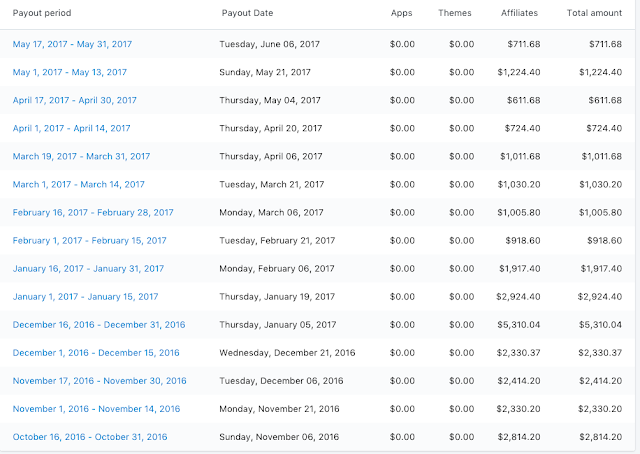 Here's an example of one of my passive income affiliate streams that I've built up and still makes me money each month. Join Earnest Affiliate to see how to do it yourself. It's been a fun month full of first experiences. I got to visit Barcelona for the first time, live in a 12th Century Monastery and start my hike across Ireland. I've learned a lot about what I want to focus on and what's important and realized that if I was doing this just for me I could easily live off of even half of this month's passive income. But since I have other people who I'm now and in the future going to be responsible for, I can't just coast off of passive income, or start dipping into savings. I need to get bak into growth mode sooner than later. That's all for this month folks! I hope everyone well in both your business and travels! Hi Johnny! That's awesome you are taking a stand for causes you believe in. I hope this is a trend that more digital nomads that have "made" it get involved in. I've thought about this often (I'm a social work major) that digital nomads that have successful 4-hour businesses can be massively effective at advocating for good causes like the one you mentioned in your post because they have personal financial resources, can work for free for their cause, and 100% focus on it. Maybe you need to coin a new term for this. Humanitarian Digital Nomad? Social Work Nomad? Haha. Anyway, thanks for the post and always being such an inspiration. Hey Austin, great idea. Maybe Social Nomads could the term? Who knows. =) But either way, I think you're right, plus even bigger than that as nomads we see so much of the world 1st hand and see their problems, meet the people and can really get involved.